This historic church, often used as an emblem of the city of Milwaukee, is the Roman Catholic Cathedral of the Archdiocese of Milwaukee. The cathedral was the work of the first bishop of Milwaukee, Swiss-born John Martin Henni, who served as head of the local Catholic Church from 1843-1881. When Henni arrived in Milwaukee in 1844, there was one small church, St. Peter’s. He bought up land near the old church and in 1846 laid the cornerstone for the new cathedral. 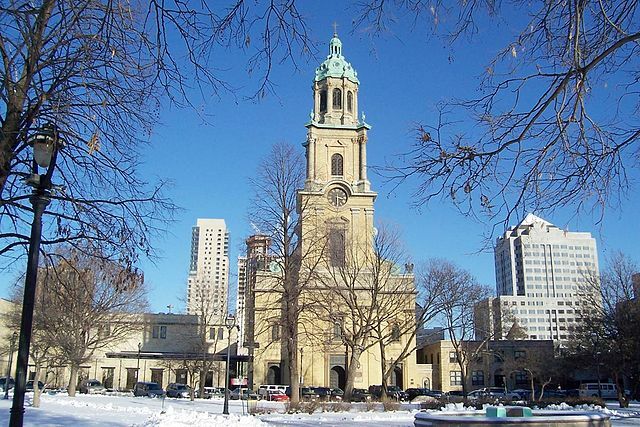 The cathedral was designed by Philadelphia architect Victor Schulte, who planned several other Milwaukee churches and St. Francis de Sales Seminary. The church’s construction proceeded in fits and starts, running out money. It was formally dedicated in 1856. The interior of the church began to be elaborately decorated in 1892 with paintings and other artwork. The decision of Archbishop Frederick X. Katzer to move his residence away from the cathedral set in a marginalization of the structure that lasted for many years. Over the years, the building was relatively neglected, coming to life only with the rare installation of a new bishop. On January 28, 1935, the cathedral went up in flames. This happened just as the Great Depression’s grip on the city was tightening and then-Archbishop Samuel A. Stritch collected money to rebuild. But he was reluctant to do so because he feared that the public image of the church would suffer if it built a new church while people were struggling. Stritch’s successor, Moses E. Kiley picked up the plans and helped shore up the struggling finances of the cathedral with the help of wartime prosperity. Kiley celebrated the Christmas 1942 midnight mass in the “new” cathedral. These buildings held sway until a new renovation was undertaken by Archbishop Rembert G. Weakland in 1999. Weakland chose the moment to re-think and redesign the historic structure, virtually eliminating its previous configuration, removing the baldachino over the high altar, moving the altar forward, relocating organ pipes and choir space in the former apse, and resituating the ambo (pulpit) and the episcopal cathedra. Pews were replaced by movable chairs. This renovation’s innovative design won plaudits but also much opposition from conservative Catholics who complained to Rome. Weakland was forced to contend with this opposition and Roman objections, and noted wryly on the dedicatory plaque when the cathedral was re-dedicated in February 2001, that the renovation was accomplished with much difficulty. Avella, Steven M. In the Richness of the Earth: A History of the Archdiocese of Milwaukee, 1843-1958. Milwaukee: Marquette University Press, 2002. O’Hearn, David J. Seventy-Five years at St. John’s Cathedral: Being a History of the Parish, Its Clergy, Schools, and Societies with Illustrations. n.p. : n.p., 1922.